A concerned paramedic saw an injured motorcyclist remove a sheath knife from his jacket and pass it to his friend as he approached him to treat him. Christopher Harwood, 31, of Matlock Place, Ingol, Preston, was involved in a crash at 5am on Black Bull Lane, Fulwood, Preston on July 3, after his Harley Davidson hit a pothole. 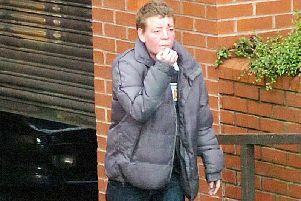 He also had a knuckle duster in his jacket, and had consumed four cans of Carling, Preston Magistrates’ Court heard. The father-of-two had struggled since the breakup of his 13 years relationship with the mother of his children. Harwood says he had attended an archery club earlier that day and used the knife in archery. He told police he had intended to weld the knuckle duster onto his bike as a decoration. Prosecuting, Adrian Hollamby said: “The circumstances are perhaps slightly unusual. “The officer says on his arrival he spoke with the paramedic who informed him there were two men at the scene. The defendant was in an ambulance. Mr Hollamby added: “He said he used the knife for archery and bought it from a website, describing it as a replica World War two knife. He said he did not carry the weapons with the intention to use them. Harwood, who admits possessing a weapon and driving with excess alcohol, appeared visibly upset as defending, Sam Mackenzie said: “ He’s aware of the seriousness of his position today. He said the former Arnold Clark car valeter, who lost his job, was terrified of prison. He revealed he previously served eight months in a YOI for possessing an imitation firearm. He got 18 weeks in jail, suspended for 12 months, a 15 month ban and must have alcohol treatment.